One of the things I wanted to explore as part of this residency was whether 'memorialisation' - the things, people and events that have been chosen to be remembered (in a civic recognition/in memorium kind of way) - and the way in which they are memorialised say something about a place? And specifically, does that memorialisation affect our experience of being in a place, and our feelings about our past, present and future here? Monuments are very much in the news at the moment, many being pulled down through direct action of people who feel they should no-longer have a presence, but also movements to create new ones that counter-balance, rather than erase, injustice/inequality in the past. See for example the success of the recent campaign to site the first monument to a woman in Parliament Square, London (the resulting statue of Millicent Fawcett made by Gillian Wearing). So I was delighted when Wanda Zyborska agreed to take me on a wander around Llandudno in search of monuments and memorialising, particularly those to women. . Wanda has thought about memorials a lot (the photo above is her being tired of war, in front of the Cenotaph). And I like the way she think, and what she does with that thinking. For example, for 6 years, she has undertaken annual ritual re-veiling of the controversial civic statue of H.M. Stanley as part of a public protest about a man who supported slavery and was guilty of crimes against humanity. Clasically , monuments are to 'heros': typically men of power and success, chosen and built by the rich. Or of self sacrifice, after exceptional service to mankind. They can also be to a central person taking part in an event. They are dominant modes of expression venerated by dominant structures. And in any situation, only the choices made by the dominant group will be heard/listened to. But it is different in Llandudno. Apart from the Cenotaph (and the new cenotaph), it is all very subtle. This is not a town built by loud industrialists, by the huge Mostyn Estate as a watering hole for (mostly) northern visitors, in order to make most money from the land they acquired after the 1843 Enclosure Act. And they still own the vast majority of the land in Llandudno - buildings (and land, including the Prom) are almost entirely leasehold. And they are Estate colours. So what we found, as we wandered around the town, is that Llandudno has hardly any monuments of the kind we'd expect to find in a town with a population of about 33,000. In fact, there is not only one statue of a real person - Queen Victoria (In Happy Valley above, with the Gorsedd stones behind). Llandudno is not the place for heroics, major battles, major fortunes, but a place to come quietly, to enjoy 'Hardd-Hafan-Hedd', a 'beautiful haven of peace', before passing on (to eternity or back to a life elsewhere). 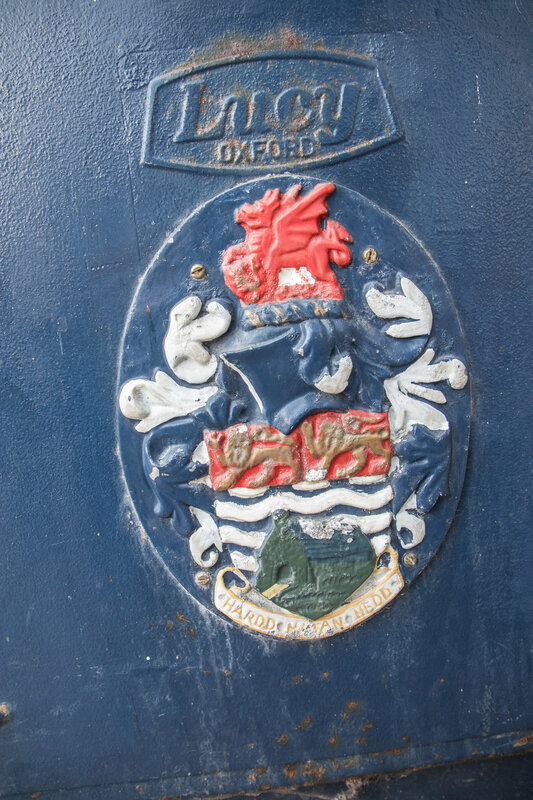 And what is memorialised reflects this perfectly: Entertainment (conductors, Punch and Judy, film makers); imagination (Alice in Wonderland); supportive people (women who have contributed to churches and good causes) and tragedy (mostly involving the sea and weather) rather than heroics. Mostly these are in the form of plaques of various kinds. You have to seek them out (or follow the interactive map). What we concluded was that the whole town is, in fact, is a memorial to the power and lineage and longevity of the Mostyn Estate. It is very subtle - street and building names, plaques and so on. 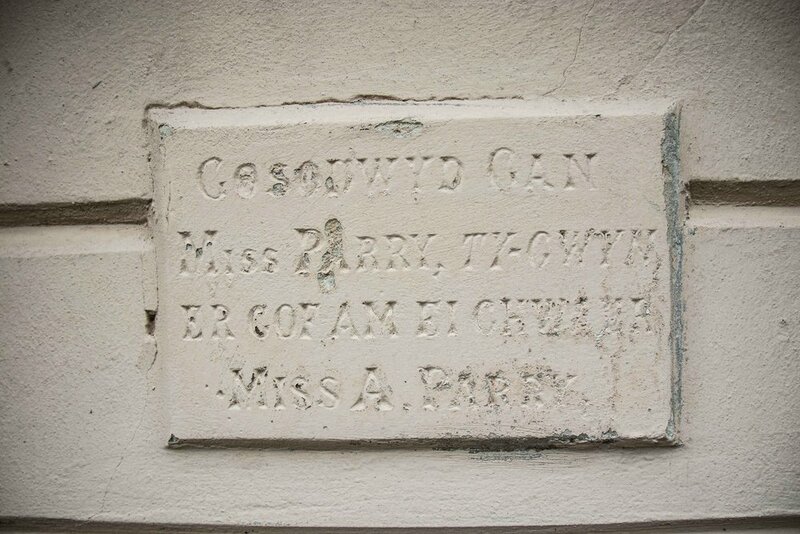 And this speaks volumes of the 'curating' role of the Mostyn Estate: Still the most powerful force in the town today. Well they are around too, and they are monuments by the people, of the people: dozens if not hundreds of memorial benches as well as The Hill of Names, Ted yr Ogof, The Winged Lady, Blodwen (Lady of the Little Orme), the WWII Roll of Honour, these are all of 'everyday people' - including a surprising number of women - without major thrusting heroics. Even the boulders that fell onto Marine drive during the floods in 1993 are memorialised by 'Not the Biggest Boulder that Fell onto Marine Drive'. 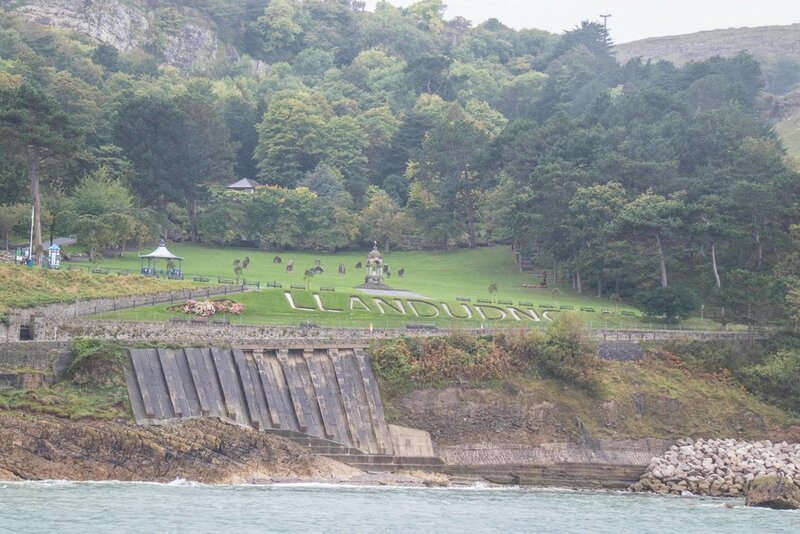 Is the naming of Llandudno after St Tudno, son of the errant Seithenyn (he who let in the floods that lost us Cantref ofa Gwaelod), foretelling of flooding in Llandudno and our need to do something about it? We thought this was all quite interesting. So in the last week of my residency, Wanda and I held a 'salon-style' evening discussion for CALL at Y Tabernacl to discuss and develop the results. As well as discussing what we'd found, and sharing information (including about the new and Obelisk - at Ffrith Hill, 1993. Built by a private owner when he restored the hall on an SSSI, opposed by the Ffrith Obelisk Action Group ) we also shared ideas about of the future of monuments and memorialising in Llandudno. After the event, Alexandra Parry, who is also artist in residence for CALL at the moment, sent Wanda and I a link to a fantastic sounding monument-based project, running at the moment, called Monument Lab in Philadelphia. It was like a fully realised version of where all this might go! They have an interactive map of all the suggestions for monuments that they are gathering from the people of the town, prototype monuments of fantastically varied kinds, and plans for an exhibition that brings it all together. Now wouldn't THAT be interesting? The next step is to map/tell the story of Llanddynes (Herstory), a past, present and future of Llandudno through the stories of the women of the town. 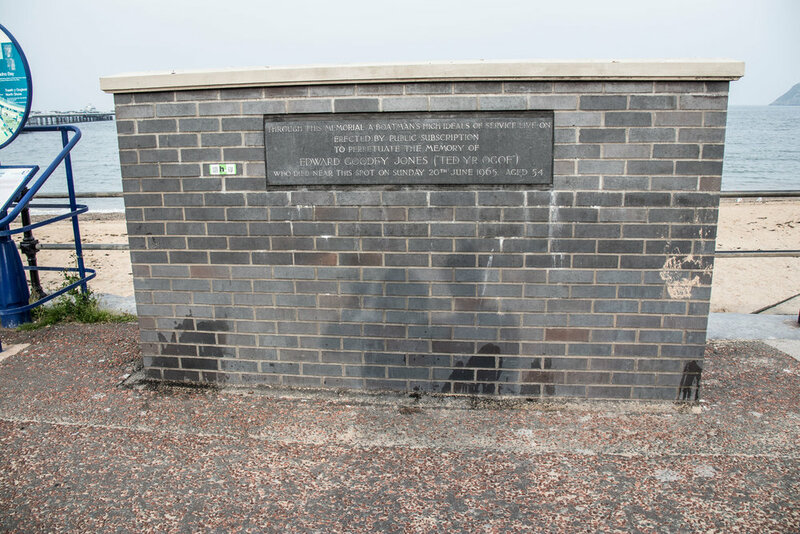 Meanwhile our map of memorialisation in Llandudno is, of course, itself a monument.